Tap the web icon on the Home screen. Or tap the Chrome icon within the Apps menu or any shortcut you may have created for Chrome. Tap the Menu icon in the upper-right corner. In the Advanced section, tap Site Settings. Content settings let you kill cookies on contact and make other determinations for websites you visit. Some websites leave cookies behind on your system. Some may be perfectly benign, like a reminder of the last page you visited on a complex site. Others may be not so innocent, like an attempt by an advertiser or other entity to track your movement around the web. In theory, the cookies are anonymous. Your tablet is just a number to the cookie-dropper. However, if the cookie comes from a site that requires you to sign in, well then you’re not all that anonymous after all. You can tell Chrome that you don’t want to allow cookies. The bad news is that some websites won’t allow you to get very deep into their content without being able to leave cookies behind. The first is an on-off switch that enables or disables the ability of sites to save and read cookie data. You can choose to turn off this feature, but some pages refuse to allow access — or at least raise an electronic ruckus if you try to visit without permitting cookies. The second option allows third-party websites to save and read cookie data. In theory, this means that an advertiser or a web provider could look at the cookies on your tablet. You can try disabling this feature by removing the checkmark, but you may run into the same problem as the general cookie blocker: websites you visit may turn you away. A safe option is to allow cookies, but also regularly clear them away. If you want to enjoy your tablet’s ability to help find the nearest gas station or helium balloon-refilling station, you have to allow the browser to provide information to sites about where you are. Your tablet has a GPS that can pinpoint your location to a few tens of yards in proper conditions; in addition to that, search engines are usually able to figure out your approximate location based on where your Wi-Fi router connects to the Internet. Is this an invasion of your privacy? It probably is, but there’s not much you can do to avoid it except not use a tablet or a smartphone or a telephone. One other note: This is one of many features that uses battery power and data. To maximize the time between recharges of your battery, you might want to turn off location sensing and the GPS module until and unless you need them. The other issue, the amount of data consumed, could result in an unexpected data charge, especially when you’re roaming. Some websites may seek to turn on your tablet’s camera. That may be a very valuable feature to you, but you should also consider the possibility — however remote — that some malicious programmer may try to spy on you by turning on your tablet’s camera without your knowledge. You might want to use the camera setting called Ask First, which blocks remote control of your camera without your permission. Just as with the camera, there are certain situations where a website might want to turn on the microphone on your tablet for things like voice recognition, dictation, or voice memos. Once again, some people worry that evildoers will try to listen in on their lives through the microphone. For that reason, consider using the setting Ask First. Among the many annoyances used by advertisers to make a buck off innocent Internet users is a pop-up ad. It might appear in front of a news article that you want to read or block an entertainment page. Once again, there’s a potential downside: Some websites may not run right if you block pop-ups, and some pop-ups blast right through this protection anyway. Many users leave on the pop-up blocking and hope for the best. Some websites ask permission to be placed on a list of exceptions to pop-up blocking, which is a polite thing to do. If a site you visit regularly insists on pop-ups, and you want to grant it permission, allow it to add its address to the exceptions. This setting is generally benign and may not apply to you. When you allow Chrome to use the Protected Content setting, the site authenticates your device to confirm that it’s allowed to display certain content. These providers place a special type of cookie, called a device credential, on your tablet or computer. 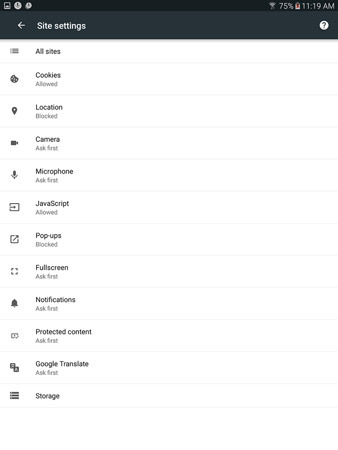 You can turn off Google Translate, which decodes foreign language websites for you, and also examine website settings, which are yet another form of cookies. If you see a site here that you don’t expect to revisit or don’t want visiting you, tap its name and then tap Clear Stored Data.